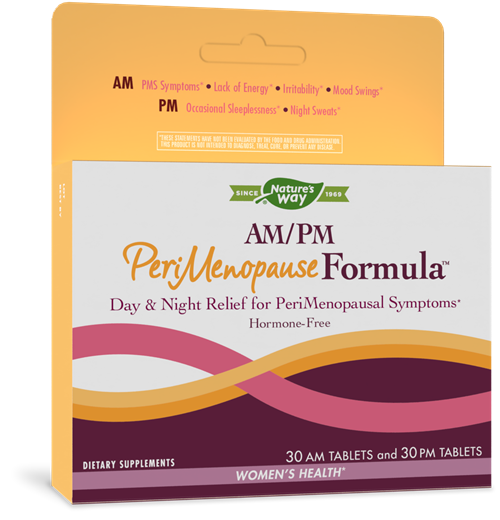 AM/PM PeriMenopause Formula™ / 60 tabs - Nature's Way®. PM: Take 1 (purple) PM tablet approximately 30-45 minutes before bedtime. PM FORMULA: cellulose, hypromellose, sodium croscarmellose, magnesium stearate, silica, carrot and paprika extract color, soy lecithin, carnauba wax. Do not use if sensitive to caffeine. Do not use if pregnant or nursing. Not recommended for use by children under 18 years of age. Each serving of the AM formula contains 50 mg of caffeine. Discontinue use and consult a healthcare professional if you have a liver disorder or develop symptoms of liver trouble, such as abdominal pain, dark urine or jaundice. Avoid alcohol and do not drive or operate machinery while taking this product. If you have a kidney disorder, are taking sedatives, tranquilizers, or any other medications, consult a healthcare professional before use.